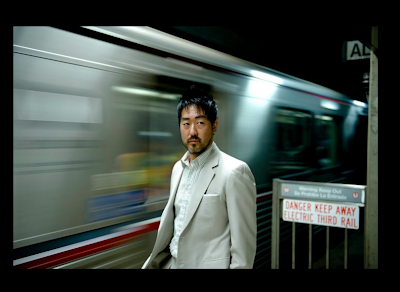 A buddy of mine, Kenneth Choi, who played my brother in a movie called Only the Brave, has a sweet role playing a Japanese-American soldier in Captain America: The First Avenger. I was very happily surprised to see that not only is he in the movie poster, he's also in the billing on the one-sheet, which I think I mentioned before is worth its weight in gold, especially at today's prices. You can actually read an article on Kenny here in the Pacific Citizen, which is an odd publication. Why's it odd? Well, it's a newspaper paid for by memberships in the JACL or Japanese American Citizens League, and for some reason, it seems to cover a lot of entertainment stories about people who aren't Japanese. The reason I'm bringing this up is that half the article was about Kenny Choi's ethnicity, which he refused (or refuses) to disclose. He had absolutely no problem playing my brother, but I think he wanted to make sure this JA advocacy newspaper wasn't going to start some letter-writing campaign against his casting, which I can totally understand. Another actor friend of mind, Bruce Locke, once had the role of a lifetime in RoboCop 3, only to have it completely diminished because of a letter-writing campaign by some Asian advocacy group. In RoboCop 3, Bruce played an evil Japanese character, which is absolutely fine by most Japanese, especially in the fictional realm, but not fine to this advocacy group. To avoid any controversy, the movie studio ended up cutting most of Bruce's dialogue and leaving in his action scenes. I think I'm both grateful for these advocacy groups and wary of them at the same time. They've often done more to hinder the progress of Asian Americans being cast in film and TV than helped it, and I'll debate that with Guy Aoki to death if he'd like. (Look him up, if you want. He's really not worth the effort, in my not-so-humble opinion.) And I guess I'm none too fond of most of these advocacy types who take it upon themselves to change things without any sort of consensus on the matter. Want an example? Well, there was once a dig on actor Sung Kang on TMZ that seemed to irk some individuals. I really thought it was harmless and actually could've helped Sung's career, but man, someone went and phoned or wrote in to TMZ to take the piece off their website, and just like that, it was gone. I don't even know if it made it to their TV show or not. Sometimes, folks, we just got to let these things play out. For better or worse. By the way, Kenny Choi did an awesome turn in a Priceline commercial not too long ago, which I'll post. I'll just end this by saying I'm glad he didn't get screwed because of some ethnicity thing. In my opinion, he's a pretty good actor.